In Houston, Texas, there is a tall, windowless building where special teams work day and night 365 days a year. Nothing on Earth keeps them from their jobs because men, women and equipment in space depend on them. As we celebrate the 50th anniversary of humankind’s first steps on the Moon, remember and celebrate the heroes of space exploration who remain on the ground—the men and women of NASA’s Mission Control. Without their efforts, no launch and no landing—whether of Man on the Moon or Rovers on Mars—is possible. takes you back in time to the Mission Control of the Apollo-era missions to the Moon with equal consideration of Space exploration today and in the future. • Sit at a console—an actual artifact from a control room at Johnson Space Center—where Mission Control team members sat and engage with interactive monitors that take you into the mission. • Learn, in either English or Spanish, why each team member’s role is critical to the success of the mission and how those roles have evolved. • Understand what it will take to launch your own career in Mission Control. • Dive deeper into the exhibit with a touchscreen interactive where the Mission Operations Control Room comes to life and you hear the personal accounts of the men and women who have been there. • Take the experience to the classroom with additional educational resources to support learning beyond the exhibit. Featuring the expertise of the Cosmosphere, an international science education center and space museum, where the comprehensive story of the Race to Space is told through the largest combined collection of U.S. and Soviet-era artifacts in the world. 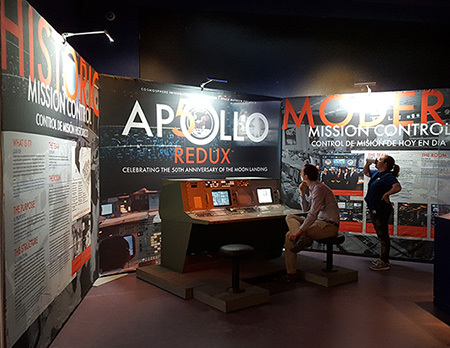 Apollo Redux brings one of the most unique exhibits available to you as only the Cosmosphere can provide it. • For more information, download the sales flyer here.